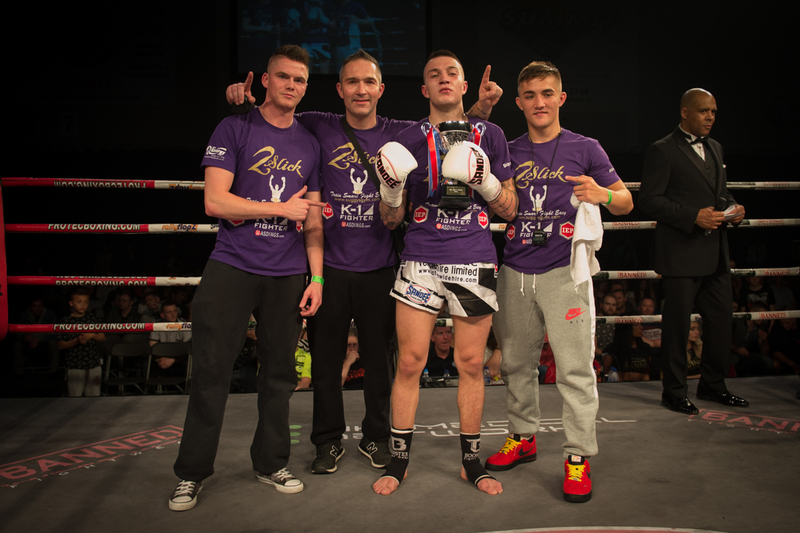 Over 200 Suggy’s Gym supporters from across the UK and Ireland made the journey to Bolton on Saturday 7 June to see their favourite fighting brothers on the card of The Main Event Arena Tour. And in front of a 3,000 strong crowd for what was billed as the biggest and best promotion in the country, Regis ‘The First’ Sugden and Chad ‘2 Slick’ Sugden did not disappoint. Returning to the event on which he made his professional debut two years ago, 20 year-old Chad was this time co-headlining in a long-awaited match up with Nathan Epps of Birmingham’s K Star Gym. Joining him on the show was 18 year-old Regis, a last minute stand in on the undercard up against the explosive and strong Danny Horton from Liverpool’s Majestic Gym. Unbeaten in his eight professional fights, Regis was extremely confident and took control from the off, dominating the first round with great boxing skills and his trademark spinning kicks. His superb speed and variety left Danny confused, looking to his corner on several occasions. With Regis ahead on points at the end of the first round, the second was closer but still a very dominant one for the Suggy’s Gym fighter, who landed several hurtful techniques. “As he went into the final round, I told him to leave nothing in the tank and show everyone just who Regis ‘The First’ is,” said coach Dean Sugden. “And what a start to the third round; it really looked as if Regis was going to force a stoppage but all credit to Danny, who dug deep and kept on trying. In the closing 30 seconds he had a real go but Regis was too elusive and quick for him and the crowd went wild as he was declared the winner on all three judges’ score cards. “I was excited to be on this show albeit as a replacement but hopefully next time my name will be one of the first on the card,” said Regis. “I followed my dad’s game plan and everything worked to perfection. With one fight down and one to go for the Suggy’s Gym professionals, their faithful fans had to wait until the end of the show to raise the roof as their World Champion and K-1 Global fighter Chad stepped into the ring. Although all his recent fights have been at world level overseas, Chad was happy to put his international duties to one side to appear on this massive UK show and looked relaxed and confident as he made his way down the walkway through the flames and smoke. From the very start, he made Nathan look slow and clumsy as he began to strike with force, speed and power. The first to land any meaningful blows when he threw a fantastic combination of punches, Chad went on to kick the inside of Nathan’s leg, felling the Birmingham fighter. As Nathan struggled to his feet, he was instantly hit again from angles that are now a trademark of Suggy’s Gym and, at the end of what was a massive round to Chad, his opponent went back to his corner looking for answers. 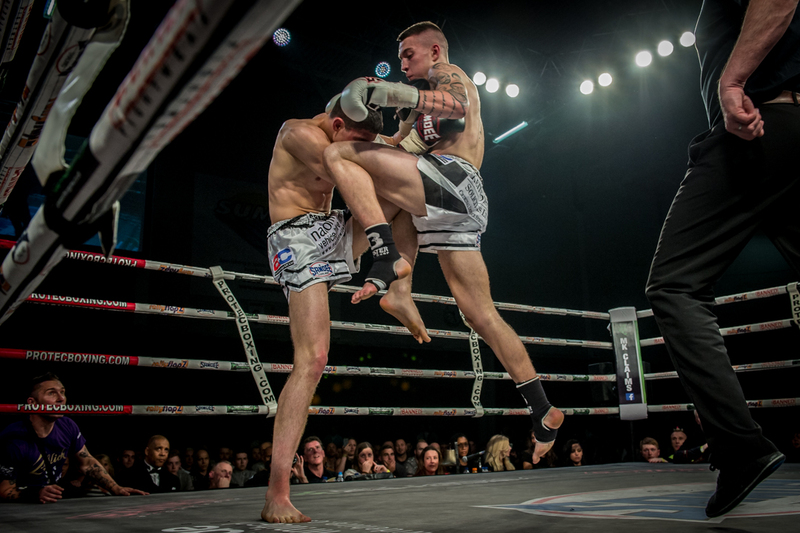 The second round followed a similar pattern, with Chad proving he was ‘2 Slick’ as he rolled under Nathan’s looping hooks, countering with speed and power before returning to the centre of the ring to dominate with kicks to the legs, body and head. In the third, Chad upped the heat on his opponent even more. Nathan tried to force the fight with his come forward style but was left missing and being punished for what seemed like slow and laborious techniques. Landing a spinning back fist and spinning back kick, Chad was making his opponent look very amateurish and started to showboat. He even dropped his hands for a short while as he knew Nathan could not hurt him, to the delight of the crowd watching Chad do exactly what he had set out to do. “In the build up to the event Nathan was very vocal, claiming that the K-1 contract should have been his and that Chad had never faced anyone of his power and size,” said Dean Sugden. “Nathan brought a very impressive record to this fight, with only eight losses in 41 outings, but we felt that Chad had fought bigger names and more established fighters, including most recently Enriko Kehl who is in the K-1 Max Final against Buakaw. 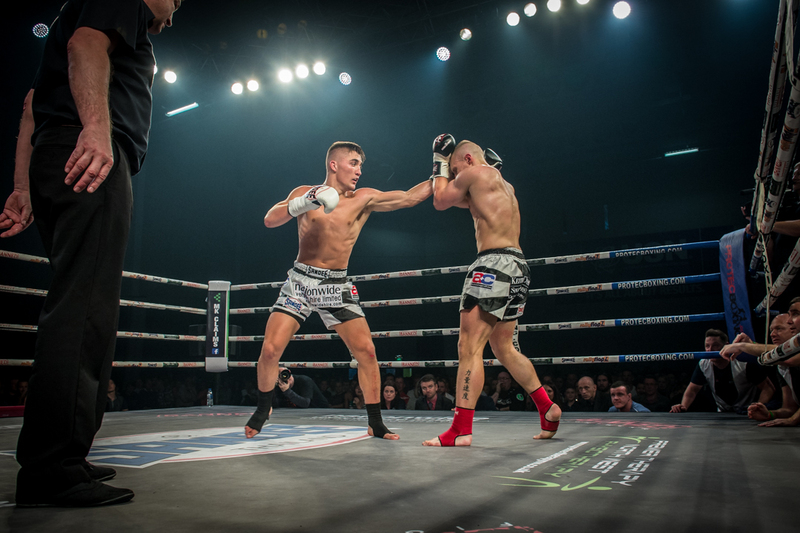 “Although he has been fighting on the world stage for over a year now, as always Chad prepared for this one like a challenger, even going to Holland last month to spar with Glory’s best fighters at Hemmers Gym in Breda. Thanking all of his sponsors, supporters and friends, Chad said: “I was pleased to be able to come back to The Main Event and the UK to co-headline the best show in the country by far. I was confident I had the skills, fitness and game plan to deal with anything that Nathan threw at me and wanted to show everyone that I could push the pace and use my skills to give him all the problems under the sun. “I’ve come through this fight with no marks or Injuries and now feel ready to get back to the world and international scene. There’s only one more UK fight for me at 70-72kg, against Glory fighter Jordan Watson, which would have to be on an independent show since I am signed by K-1 Global. Also on the horizon for Chad is a show in Ireland due to be announced shortly by K-1 Global, who definitely want the Suggy’s Gym fighter to feature among the headliners.